A discussion has been opened on this Meditation. To contribute your own thoughts to this exchange, please use the Contact form. Back in 1869 in Cardiff New York, an avowed atheist named George Hull got into an argument with a preacher from a travelling revival show over whether or not the Bible should be read literally. The specific verse in question was Genesis 6:4. The preacher argued for the complete and absolute truth of the passage. Hull got an idea. Hull and his brother-in-law were making a nice little side-income by charging believers 50 cents a head to view the "fossil" when investors offered them $30,000 for it so they could display it in Syracuse New York where larger crowds could be expected. PT Barnum was so impressed by how well the Syracuse exhibit was doing, he offered $60,000 just to borrow the "fossil" for three months. When he was turned down, he made a plaster copy which drew bigger crowds than the original. 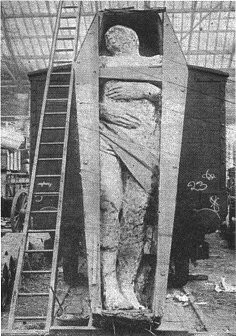 Eventually, the Cardiff giant drew the attention of scientists and a Yale paleontologist examined it. Quickly finding clearly identifiable chisel marks in the stone which would not be present in a genuine fossil and which would have somewhat eroded in a long-buried ancient statue, he declared the giant to be a fake. And yet, people continued to pay to see the biblical giant even though most now recognized it was all a hoax. The original can be seen to this day in the Farmers' Museum in Cooperstown and Barnum's copy is in Marvin's Museum near Detroit. Now it gets even more unbelievable. In 1895, a fossilized giant was apparently discovered in County Antrim, Ireland and shipped to London where it was photographed and the picture published in The Strand magazine. This giant was reportedly taller than the Cardiff Giant at over 12 feet. Somehow in spite of its size, the "Fossilized Irish Giant" managed to disappear shortly after this picture was taken. 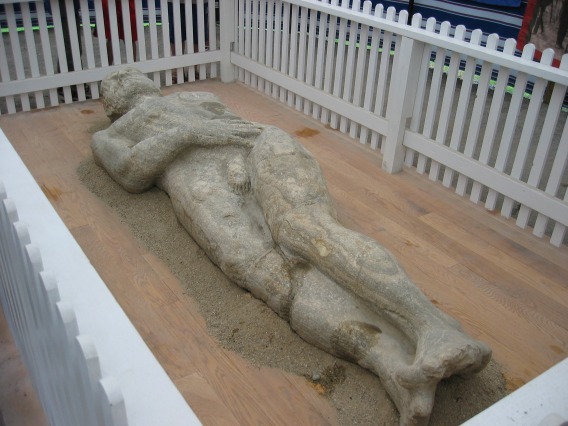 Look at the similarities of pose between the proven fake Cardiff Giant and the mysteriously missing Irish Giant. Does this not suggest that someone copied PT Barnum's idea of copying the Cardiff Giant? Does the perspective look right in this photograph? Is the "giant" really taller than that freight car in the background. Or is this a carefully selected camera angle to make a much smaller statue look immense? Is the photograph of the fake itself a fake? The Strand was primarily a fiction magazine. It also published puzzles and brain-teasers. And yet today there are still those who believe the Irish Giant was real. No-one has to believe in the literal truth of Genesis 6:4 (or any other biblical passage) to find spiritual truth in the Bible. But the success of these hoaxes make it seem that many of those who insist on the bible's literal truth may be more gullible than the rest of us.